As parents, we all seek to provide what we believe is best for our kids. Research studies around the globe reveal again and again that the top three things most parents hope for their children are happiness, health and a preparedness for the future. Now, imagine that there was a school that was intentionally designed to do all these things and more. A school that was dedicated to academic excellence, developing a love for learning, and preparing young people for the ever-changing world of work. There is a school that fits this description and it’s opening this August here in Denver. It’s name is the CUBE High School. The CUBE is co-founded by former Steele Elementary parent Dr. Jim Stephens and his long-time colleague from the Denver School of Science & Technology Bret Poppleton. 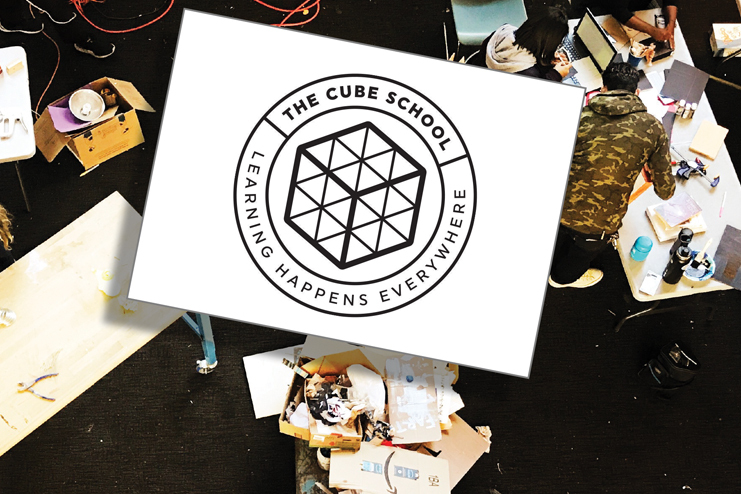 The CUBE experience integrates authentic knowledge of self, a dynamic schedule, computational thinking, and interdisciplinary learning (the “Mash-Up”) to create a learning environment that is truly innovative in Denver and beyond. Bret and Jim see the CUBE as an unique opportunity to cultivate socially and emotionally intelligent learners who have the foundational knowledge, creative problem solving skills, and strength of character to tackle the challenges of a dynamic world. We all recognize that we are living in a period of huge transformation: technological, social, and economic. While we can’t know exactly what the future holds, that is we can’t predict the future, neither can we assume that today’s practices will be relevant tomorrow. In the world of education we can’t assume that our current practices will be relevant tomorrow either. We need the future of learning now. The culture of learning at the CUBE not only orients itself towards the future but places the learner at the center of the experience. A learner-centered experience is about an entirely new way of seeing, thinking about, and acting on learning. It focuses on three key aspects about the learner. First, each learner is seen as being unique in meaningful ways. They have unique backgrounds, circumstances, and starting points with unique strengths, challenges, interests, and aspirations. All of these unique attributes call for unique responses from their learning environment. Second, each learner is seen as having unbounded potential—potential that will unfold at its own pace and in its own way. Every single learner is a wonder to behold. And, finally, each learner is seen as having an innate desire to learn. Thus, in this paradigm, learners are active participants in their learning as they gradually become owners of it, and learning itself is seen as an engaging and exciting process. Each student’s interests, passions, dreams, skills, and needs shape his or her learning experience and drive the commitments and actions of the adults and communities supporting them. How does the CUBE make this happen? There are five unique elements. These elements are not just novel – they are innovative new ways of moving any learner forward. A “Who am I” Curriculum: Three questions drive the foundation of every student experience at the CUBE – Who am I? Whose am I? and Where do I come from? Because of “who you are”, you are a unique, capable and amazing person empowered to change the world. Dynamic Scheduling: The CUBE is reexamining time to acknowledge that learning happens everywhere, with everyone, and all the time. This requires that we use a research-based restructuring of time to better reflect the pace of learning rather than strict bell schedules. Thinking +: The essence of the CUBE is the “Mash Up”, a cross-curricular smashing together of ideas, concepts and problem-solving that teaches us to think more deeply about the world. Interaction: All interactions – human to computer, computer to computer and human to human – are becoming more and more complex. Understanding that complexity and learning to move among it is essential to navigating the future successfully. Pivoting: College should be an opportunity for all students but it shouldn’t be the only choice. Students will need to explore, change and adapt to possibility as it appears. The CUBE is designed as a launching pad for students to find opportunity, explore possibility and thrive as adults in the future economy. If you want to learn more about the CUBE please attend one of their open houses on January 8th or January 22nd from 6pm-8pm at the Vicker’s Boys & Girls Club at the Nancy P. Anschutz Center on 33rd and Holly in North Park Hill. Please feel free to send questions to jim@thecubedenver.org. Their website is thecubeschool.org.